I just got home from an AMAZING trip with my hubby to Mexico. We went snorkeling, biking, walking, zip-lining, shopping, eating, wading, sunbathing, and ruin-exploring. The picture above is El Castillo at Chichen- Itza- one of the new 7 Wonders of the World. What an experience! It was wonderful, and though I am now peeling from my sunburn and a little jet-lagged, I'm excited to be home with my three lovely children. It's good to go on vacation, and it's great to come home. I've missed the blog, too. I don't know how many loyal readers I actually have, but I miss writing, crafting, and interacting with those of you who do visit regularly. So, I'm back in my routine with a scrapbook page for you today. 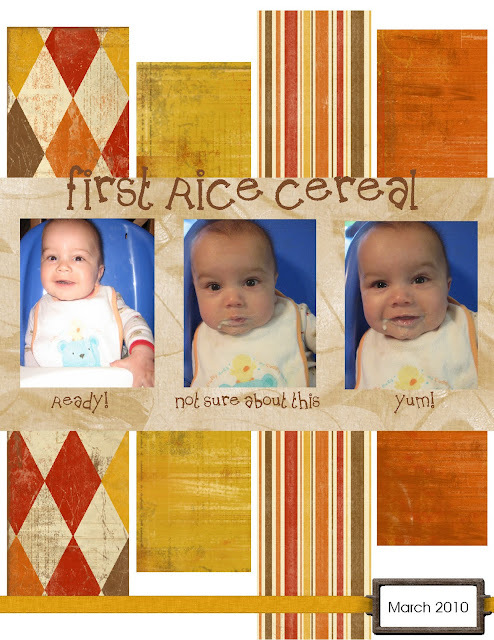 This is my youngest son's first taste of rice cereal. He was a little over five months. I love the middle picture- he made such a cute face when he tasted the cereal, and I'm so glad I was able to capture it. Got any cute pictures of your babies eating? Just found your blog!!! Darling stuff!